Red marks the area most commonly associated with the term Inner Banks. Yellow marks the additional area sometimes included in Inner Banks definitions. The Inner Banks is a neologism made up by developers and tourism promoters to describe the inland coastal region of eastern North Carolina. Without historical precedent, the term "Inner Banks" is an early 21st-century construct that is part of an attempt to rebrand the mostly agrarian coastal plain east of I-95 as a more attractive region for visitors and retirees. The current Inner Banks region was historically grouped with the Sandhills as the Carolinas and Georgia's Piney Woods. Around the time of the Civil War, people from the area were known as "Goobers". The regional name and demonym fell from use over time as the area was deforested. The present term suggests relation to the historical area known as the Outer Banks, a string of barrier islands off the coast of North Carolina that have long been a popular tourist attraction. The demand for waterfront property in eastern North Carolina as a site for second homes for the relatively wealthy has resulted in a tremendous disparity of prices in such locales. Frequently otherwise equivalent lots on opposite sides of a road will have broadly divergent tax and appraisal values. 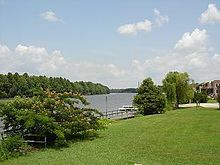 For example, on Rock Creek Road in Jones County, riverfront lots on the Trent River had a tax value of $201,286 per acre; lots immediately across the road hade a tax value of $33,634 per acre, according to the Jones County GIS maps. The developers and tourism promoters have broadly defined the Inner Banks as an area on the East Coast of North Carolina that is 22,227 square miles (57,568 km²). The so-called Inner Banks comprises over 3,000 miles of inland coastline and is home to over 2.5 million residents. Marketing people include the Crystal Coast and Albemarle regions of the state in the Inner Banks. Having a moderate climate, the area is becoming a popular destination for retirees and small business entrepreneurs. "Inner Banks" is sometimes abbreviated with the acronym IBX, another attempt at trendiness. The general definition states that the Inner Banks is a region between Interstate 95 to the west, the Outer Banks to the east, and extend from the Virginia border to the South Carolina border. Consisting of 41 counties, the region is three times the size of the state of New Jersey. Many areas farther from the sounds and tidal rivers have not embraced the Inner Banks brand and are seldom included in the definition. Traditionally dependent on agriculture and the textile industry, eastern North Carolina has worked to redefine the region's strengths to transition into the new global economy. Six small towns in the Inner Banks have joined together in what they call the Creative Communities Initiative. They are working to foster an environment attractive to knowledge workers, artists, and other people working in the creative economy. These six towns are: Ayden, Edenton, Hertford, Murfreesboro, Plymouth, and Tarboro. Northeastern North Carolina (or the Albemarle Region) consists of 16 counties in extreme northeast North Carolina that surround Albemarle Sound and its tributaries, such as the Chowan and the Roanoke rivers. It has numerous attractions in terms of its undeveloped beaches, rivers, and small towns. Historic sites within the Albemarle Region are identified along the Historic Albemarle Tour. This waterway-rich region was inhabited for thousands of years by various cultures of indigenous peoples. By the historic period of European contact, the coastal area was occupied primarily by Algonquian-speaking tribes. The other two major language families of historic tribes in the state were Siouan languages and Iroquoian languages. After European contact, the area which is now northeastern North Carolina and southeastern Virginia was one of the first in North America to be settled by English and related northern Europeans. Virginia Dare was born on nearby Roanoke Island in 1587, in what is today part of North Carolina. She is recorded as the first English child born in North America. The Roanoke colony did not survive. From the 17th century through the antebellum era, the cash crops were tobacco and cotton, both of which were labor-intensive in cultivation and processing. Major planters imported thousands of enslaved Africans for their work force through 1808, when the Atlantic trade was prohibited by Congress. They and their descendants were integral to the survival and success of the North Carolina colony and later state. Tobacco was especially labor-intensive and exhausted the soil. Some of the first tobacco planters shifted to mixed farming by the end of the 18th century in order to restore their soils. Most of the region was relatively prosperous for white planters until the American Civil War. The productive farmland and shipping industries became a frequent target for Union invasions. Several towns in the region were burned to the ground by Union troops during this time, including Plymouth and Winton. Confederate forces at Plymouth made the first use of an ironclad warship, the CSS Albemarle. After the war, the South continued to rely on agriculture, which suffered a decline through the end of the century. The region was slow to change its economy. View of Roanoke River National Wildlife Refuge from Plymouth, NC. ^ "goober, n.", Oxford English Dictionary, Oxford: Oxford University Press . ^ Schele de Vere, Maximilian (1871), Americanisms, p. 57 . ^ a b "Carolina's Inner Sanctum" (PDF). Tampa Tribune. October 15, 2006. ^ "Series: The New Waterfront". News and Observer. July 31, 2006. Archived from the original on July 1, 2006. This page was last edited on 16 September 2018, at 17:53 (UTC).